WARNING: Metformin may rarely cause a condition called lactic acidosis, which is sometimes fatal. Seek immediate medical attention if you develop any symptoms of lactic acidosis including unusual tiredness, severe drowsiness, cold skin, muscle pain, breathing trouble or rapid breathing, or unusually slow or irregular heartbeat. Lactic acidosis is more likely to occur in patients who have heart failure, kidney or liver problems, excessive alcohol use, a lack of body fluids or dehydration, x-ray or scanning procedures that require an injectable iodinated contrast drug, surgery, a serious infection, heart attack, or stroke. Also at higher risk are the elderly, especially if over 80 years of age and have not had kidney and liver tests. Discuss the benefits and risks of using this medicine with your doctor. Additional monitoring of your dose or condition may be needed if you are taking other diabetes medicines such as glyburide or insulin, or cimetidine. Certain medicines may make your diabetes more difficult to control by affecting blood sugar. Report any medicines to your doctor that may affect your blood sugar including, "water pills" (diuretics such as hydrochlorothiazide, furosemide); birth control pills; estrogens; corticosteroids such as prednisone; niacin; phenytoin; decongestants; high blood pressure medicines including beta-blockers such as propranolol; calcium channel blockers such as nifedipine; ace-inhibitors such as captopril; phenothiazines such as chlorpromazine; isoniazid; thyroid medicines; clomiphene; fenugreek; or ginseng. Use of this medicine is not recommended if you have a history of kidney disease, liver disease, congestive heart failure, heart failure, lactic acidosis, metabolic acidosis, diabetic ketoacidosis, recent heart attack, recent stroke, serious infection, or dehydration. Inform your doctor of any other medical conditions including burns, heart or lung problems, recent trauma, blood problems (anemia, vitamin B-12 deficiency), scheduled upcoming surgery, scheduled upcoming x-ray or scanning procedures, alcohol use, any allergies, pregnancy, or breast-feeding. If you are scheduled to undergo any x-ray or scanning procedure using injectable iodinated contrast material, be sure to inform your doctor that you are taking this medicine. You will need to temporarily stop this medicine around the time of your procedure. Consult your doctor for further instructions. Do not start or stop any medicine without doctor or pharmacist approval. Take this medicine with food. Drink plenty of fluids while taking this medicine. Continue to take this medicine even if you feel well. Do not miss any doses. Use this medication regularly in order to get the most benefit from it. To help you remember, use it at the same time(s) each day. This medicine may come with a patient information leaflet. Read it carefully. Ask your doctor, nurse, or pharmacist any questions that you may have about this medicine. Store this medicine at room temperature in a tightly-closed container, away from heat, moisture, and light. If you miss a dose of this medicine, take it as soon as possible. If it is almost time for your next dose, skip the missed dose and go back to your regular dosing schedule. Do not take 2 doses at once. Do not take this medicine if you have had an allergic reaction to it or are allergic to any ingredient in this product. Laboratory and/or medical tests such as liver and kidney function tests, fasting blood glucose, glycosylated hemoglobin, or complete blood counts, should be done to monitor your progress or to check for side effects. Regularly check your blood or urine sugar as directed by your doctor. If your blood sugars have been under control and suddenly are difficult to manage, contact your doctor as soon as possible. Before you have any medical or dental treatments, emergency care, laboratory tests, or surgery, tell the doctor or dentist that you are using this medicine. During times of stress such as fever, infection, injury, or surgery it may be more difficult to control your blood sugar. Consult your doctor, as a change in your medicine may be required. This medicine usually does not cause low blood sugar, or hypoglycemia, but this effect may occur if you do not consume enough calories from food, juices, fruit, or other sources. The symptoms of hypoglycemia include chills, cold sweat, dizziness, drowsiness, shaking, rapid heartbeat, weakness, headache, fainting, tingling of the hands or feet, or hunger. 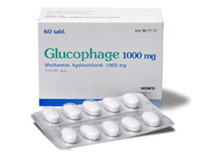 It is a good habit to carry glucose tablets or gel to treat low blood sugar. If you are in a situation where you don't have these reliable forms of glucose, eat a quick source of sugar such as table sugar, honey, candy, or drink a glass of orange juice or non-diet soda to quickly raise your blood sugar level. Tell your doctor immediately about the reaction. To help prevent hypoglycemia, eat meals on a regular schedule and do not skip meals. Symptoms of high blood sugar, or hyperglycemia, include thirst, increased urination, confusion, drowsiness, flushing, rapid breathing, or fruity breath odor. If these symptoms occur, tell your doctor immediately. Your medicine dosage may need to be increased. Limit alcohol intake while using this medicine. Before you begin taking any new medicine, either prescription or over-the-counter, check with your doctor or pharmacist. Caution is advised when using this medicine in the elderly since they may be more sensitive to the effects of this medicine. For women: this medicine can cause changes in the menstrual cycle of women with certain fertility problems, therefore increasing the risk of becoming pregnant. Consult your doctor or pharmacist about the use of reliable birth control while using this medicine. If you plan on becoming pregnant, discuss with your doctor the benefits and risks of using this medicine during pregnancy. It is unknown if this medicine is excreted in breast milk. Do not breast-feed while taking this medicine. This medicine is not a substitute for proper diet and regular exercise. It is recommended you attend a diabetes education program to better understand diabetes, prevention of complications, and all the important aspects of its treatment. These include meals/diet, exercise, weight loss, personal hygiene, medicine and blood glucose monitoring, and the need for regular eye, foot, and medical exams. Follow your doctor's instructions carefully. Do not share this medicine with others for whom it was not prescribed. Keep this medicine out of the reach of children and pets. If using this medicine for an extended period of time, obtain refills before your supply runs out.